Die-hard regulars at Fagagna’s Udine Golf Club in San Marino, Italy now have a genuine reason to never leave the greens. In a small clearing right in front of the ninth hole, flanked by slender cone trees on one side and the snow-capped Friulian Dolomites on the other, local studio Uppercut has inserted four head-turning villas. Each elongated volume comprises two apartments with separate entrances and can be adapted to fit between one and eight guests. 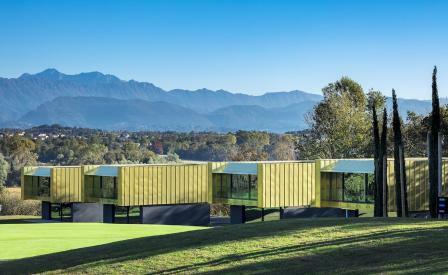 The ground floor studio, recessed with a patio, is lined with African teak and stainless steel, whilst the upper cantilevered level is composed of a customized, pre-fabricated steel frame that’s sheathed in matt gold and opens out to lofty views of the golf course and mountains. If the club spa doesn’t tempt with its offerings of Turkish bath, Finnish sauna, and indoor and outdoor pools, perhaps the clubhouse restaurant’s tagliolini and prosciutto from nearby San Daniele del Friuli might.